Epipactis gigantea is a member of the Orchidaceae Family. 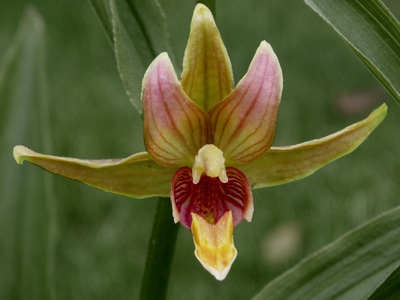 A hardy Orchid that is found in much of western U.S. and up into British Columbia. 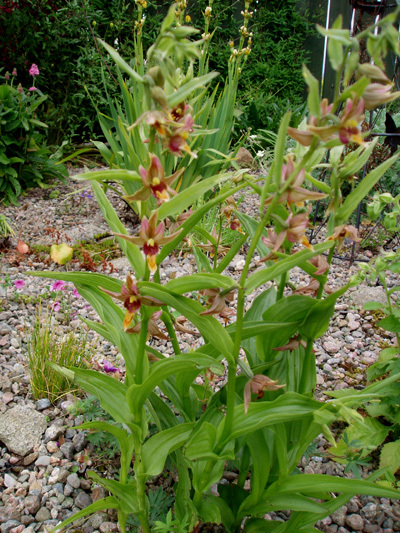 Although it grows in damp meadows and along stream banks in its native habitat, the common American name being 'stream orchid', we have it growing in full sun on the scree bed and along the path of a semi-shaded herbaceous border. Its leafy stems can grow to 60cm. ours grows 35cm to 40cm. In June and July flowers form at the leaf joints along the top half of the stem. The leaves, 8 to 12 per stem, are glossy green; the flowers are 30mm across and are in shades of red, pink, green, yellow and white. It has vigorously spreading rhizomes that form large clumps quite readily; we divide ours in spring approximately every three years. This is an ideal first orchid for those looking for something a bit different.